At the AA Sports Day held in the Red Lion field little action appears to be taking place, although many of the spectators are facing to their left. 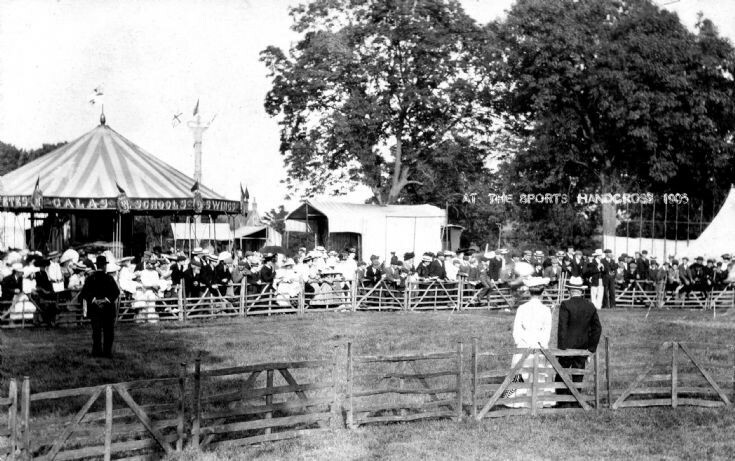 A funfair was a regular attraction at the combined flower show and sports day which was usually held on a Wednesday probably for the benefit of the shopkeepers who closed their premises on the weekly early closing day. The many estate workers in the parish were given the day off, and the schools also closed. Just to the right of the funfair tent, in the distance, can be seen the gable end of the Red Lion facing the bridge. Of course, since the dramatic fire of 1978 the pub has a redesigned gable end!